Thanks to Christopher Jon "Chris" Sewell who spotted this plaque while in Quebec City on August 8, 2007. 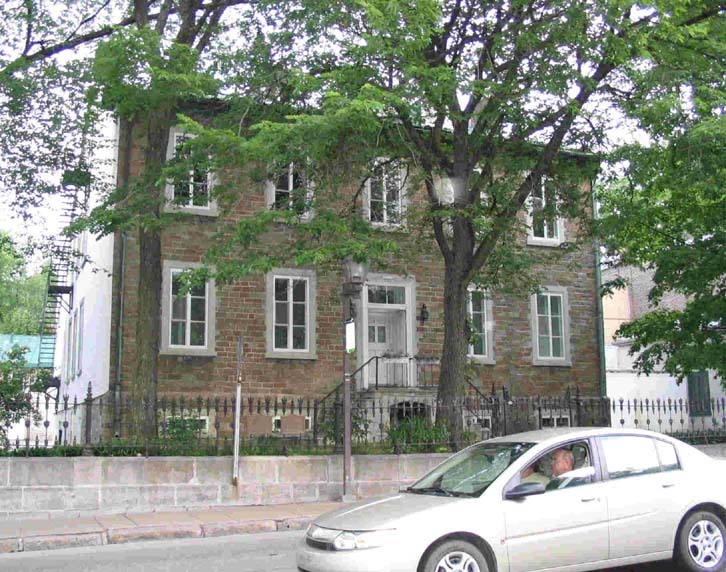 The plaque is located in front of the house at 87 Rue St-Louis between Rue D'Auteuil and Côte de la Citadelle. This is across the road from Parc de L'Espanade. 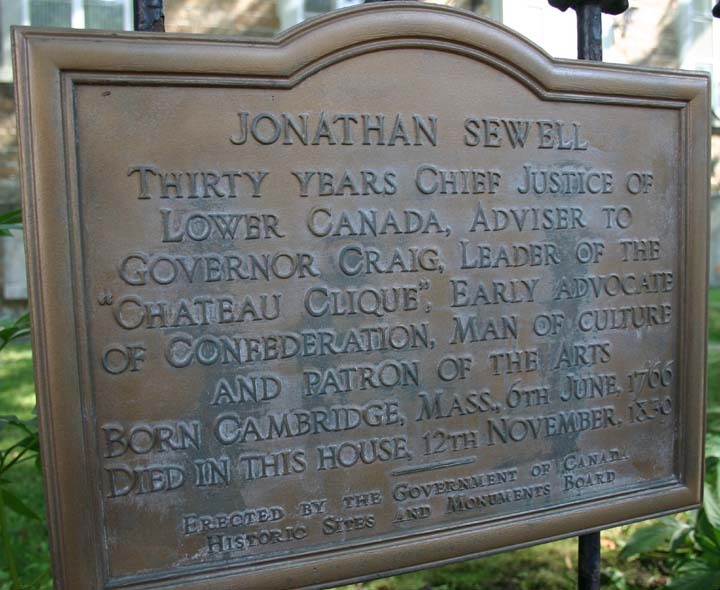 The family of Chief Justice Jonathan Sewell (1766 - 1839) appears to have connected with several addresses in Quebec City. The home of Jonathan Sewell appears to have been 87 St. Louis Street (Rue St. Louis) as indicated on the plaque above. Rev. Edmund Willoughby Sewell, a son of Jonathan Sewell, "was born in the house on St. Louis St., on the 3rd day of September, 1800 . . . .." (Rev. A. R. Beverley, "Trinty Church - A Historical Sketch", 1911.) Chief Justice Jonathan Sewell died at 87 St. Louis Street on November 12, 1839 as shown on the plaque above. above: 87 Rue St. Louis, Quebec, QC. left: close up of front door. 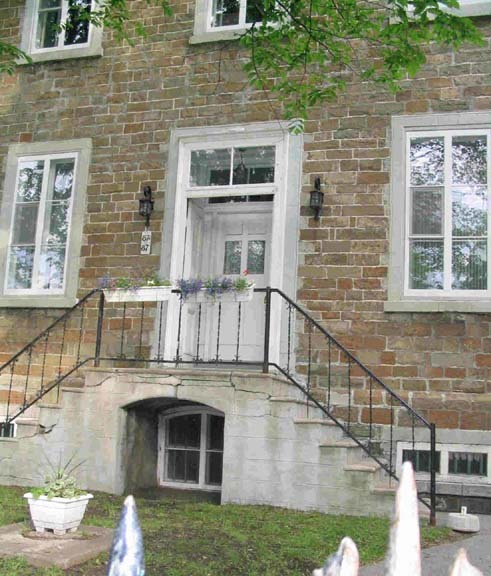 Estelle Hughes wrote: "Mary, Pat, Sue and I climbed the steps and rang the bell but no one answered. It seems to be apartments now." The house numbers below indicating "87A" and "87" would also indicate the house has been broken up into flats or apartments. Thanks to Estelle Hughes for the photos and information. there were two apartments; #87 on the first floor and #87A on the second floor. the walls were 3 feet thick. the first floor featured 14 rooms and 5 fireplaces. the second floor had 21 rooms and 5 fireplaces. there was also a huge attic. it was a great house for children to play hide and seek. there was a huge backyard, at the end of which were military offices. ". . . when the Queen of England came to visit Quebec City in 1964, there was a big riot just next to the house, which is located right next door to the Garrison Club and just a few feet from the Côte de la Citadelle. ". . . during that period, we had quite a few bomb scares. The Quebec Liberation Front were leaving brown paper bags regularly at statue across the street, in-between the feet of the bronze soldier (at the Parc de l'Esplanade). I had my bedroom at the front of the house and the police came to warn us to avoid the front part of the house for a while in case there was an explosion. "We also had the Quebec Winter Carnival parade at the door and my parents threw huge parties for the occasion. Great memories!" Chief Justice Jonathan Sewell resided at 87 St. Louis Street. The Hotel Acadia on St. Ursule Street would appear to be stretching things a bit by claiming their property to have been "the home of Chief Justice Jonathan Sewell." Jonathan owned the property on St. Ursule Street and his son, Rev. E. W. Sewell, resided at 41 St. Ursule Street which is now in all likelihood a part of the Hotel Acadia. "Le Manoir d'Auteuil was built first as a single family home on land purchased in 1835 by the Sheriff William Smith Sewell (1798-1866). "Sheriff Smith Sewell commissioned in 1835 the architect Frederick Hacker to design a house of stone four stories tall in a "London style" that we know now as Le Manoir D'Auteuil. He contracted the mason Pierre Bélanger to build the walls with stone from Cap-Rouge, with an arched stone entrance that still exists today. Sheriff Smith Sewell built Le Manoir at a cost of 565 English pounds! "In 1853 only 20 years after its construction, there was a fire at Le Manoir but the original stonewalls and archway remained. The sheriff then rebuilt the home and kept it in the family until 1871." For further details, please click to visit Le Manoir d'Auteuil. For 21st century photos, please click to visit Old Sewell Homes. Click to return to Jonathan Sewell on The Sewell Page.